A silence descends, broken only by the occasional plop of water dripping from the stalagtites protruding from the ceiling. A loud pop resounds in the enormous cavern, echoing in the galerie des peintre, startling you out of your reverie. Raphaël Pommier, today’s SpeleOenologue has opened his wine ! an organic wine aged for over a year in oak barrels place 80 meters underground in the majestic Grotte de Saint Marcel d’Ardeche. 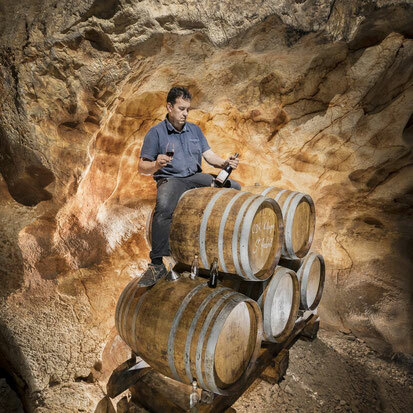 It’s in the cave of Saint Marcel d’Ardèche that Raphaël Pommier, passionate organic winmaker, ages some of his wine. The cuvée which is aging in this Natural Wine Cave of the Ardeche Canyon, will bear the name Vinolithic once brought back to the surface. This organic Côtes du Rhône Villages red, from Notre Dame de Cousignac winery, in Bourg St Andéol in Ardèche, reflects in its beautiful robe the wonderful colors of the monumental gallery of the Cave of Saint Marcel d’Ardèche. Vinolithic is a wine with much complexity and savory notes coming from the terroir. It is to be tasted underground, during a SpeleOenologie® tour or anytime you wish to enjoy a great meal ! Do you have underground tastings on Sudays in May?